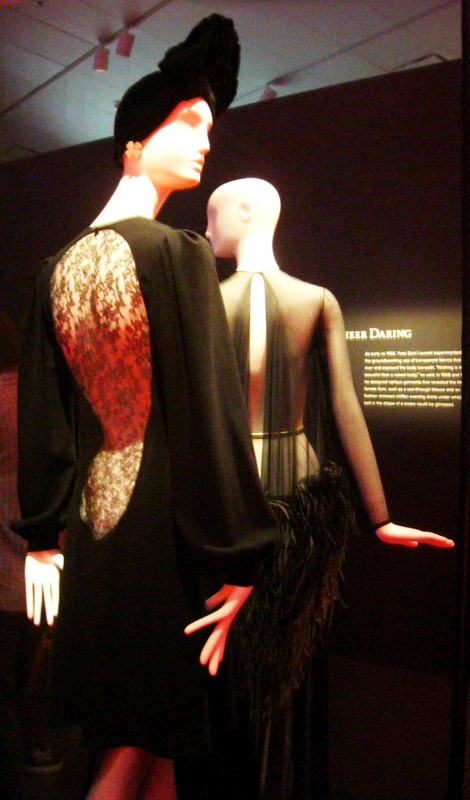 The highlight of my week-long business trip to Denver was the Yves Saint Laurent retrospective at the Denver Art Museum. 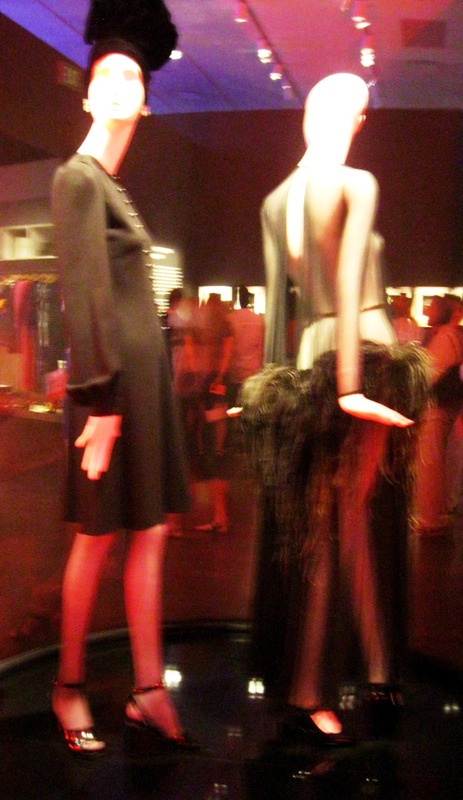 It is the same exhibition that took place in Paris two years ago (and which I blogged on here). Once again, it was a great opportunity to remember Saint Laurent’s genius and wonder at his elegant, chic and oh so Parisian collections. 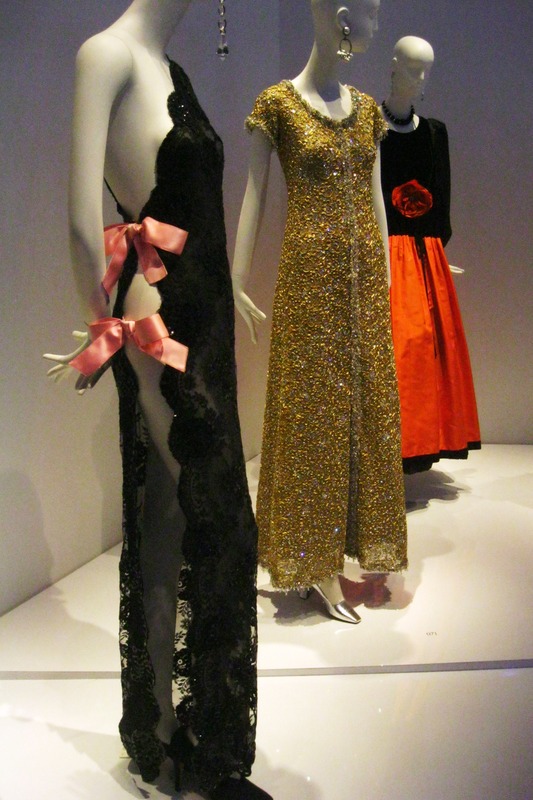 The retrospective starts with designs Yves Saint Laurent created when he took over the head of Christian Dior in 1958 after the passing of the great designer. Can you believe Saint Laurent was only 22 then? 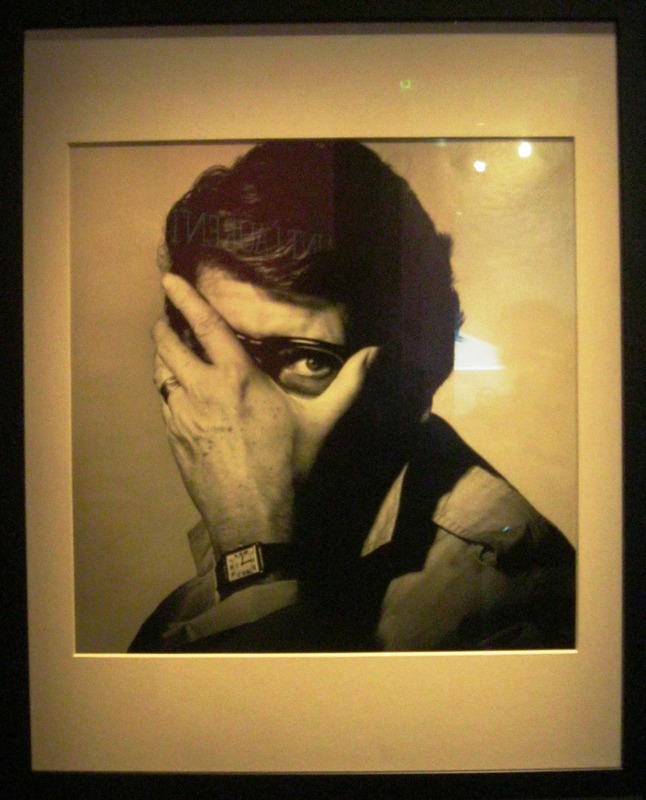 Yves Saint Laurent then established his own house with his business and life partner Pierre Bergé. 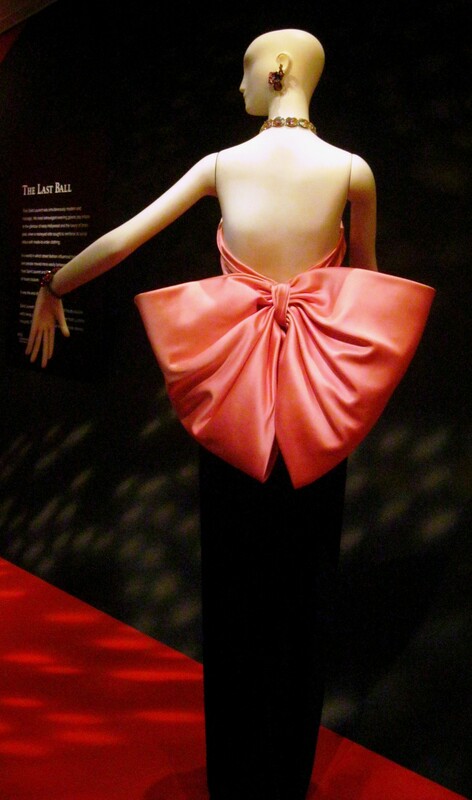 Some of his designs have become iconic and largely imitated though they were quite revolutionary at the time. The suit for women is the most famous example. 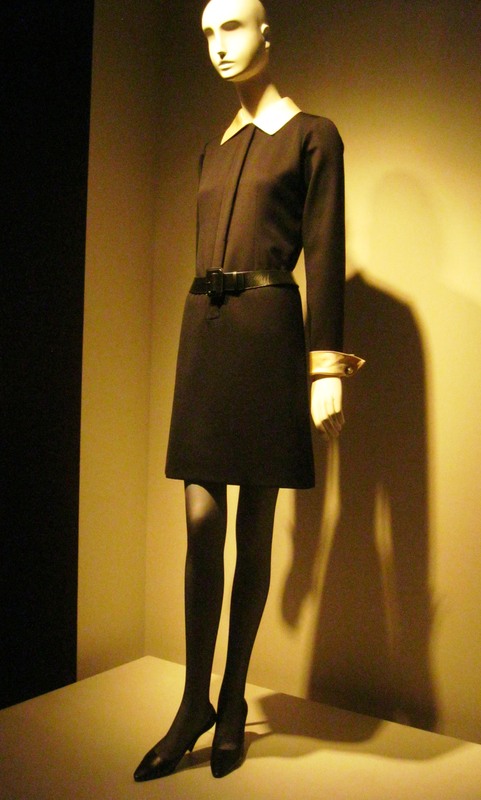 I remember being told of Saint Laurent’s friend and muse Nan Kempner wearing one to a restaurant in New York City. She was denied entrance because of it and decided to lose the pants so that the long jacket would give the illusion of a dress. 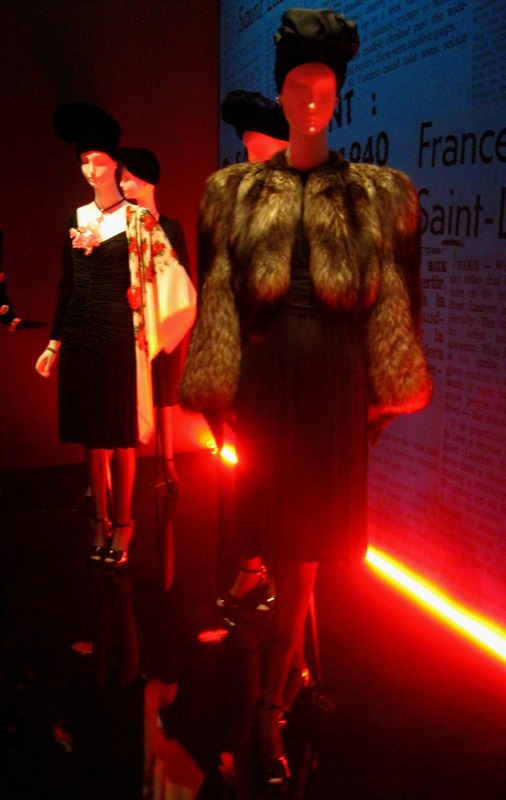 A room is dedicated to Yves Saint Laurent’s friendship with Catherine Deneuve and their collaboration on several of her films. 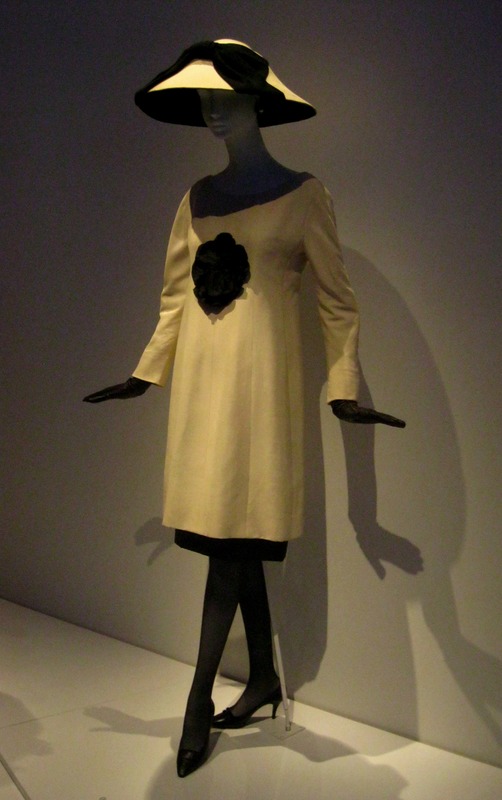 I love the dress he designed for Belle de Jour in 1967; one would never suspect Séverine of hiding such naughty secrets with her strict and elegant look. The 1971 collection was scandalous in its time. Critics called it vulgar and of bad taste, which I find ironic now that most designers dream of reaching this level of elegance. 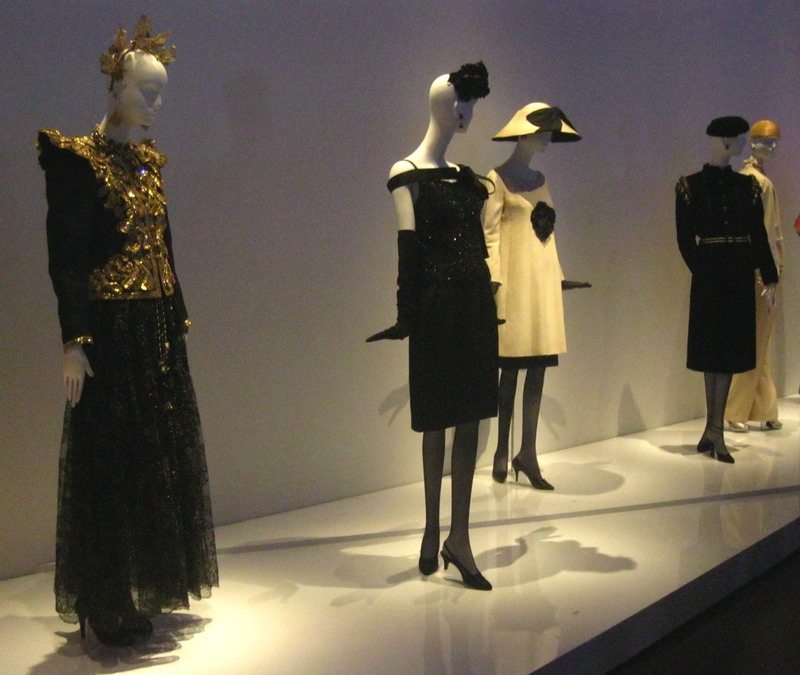 Although Yves Saint Laurent rarely traveled abroad apart from Morocco, he was influenced by exotic lands like Africa, China and Russia. 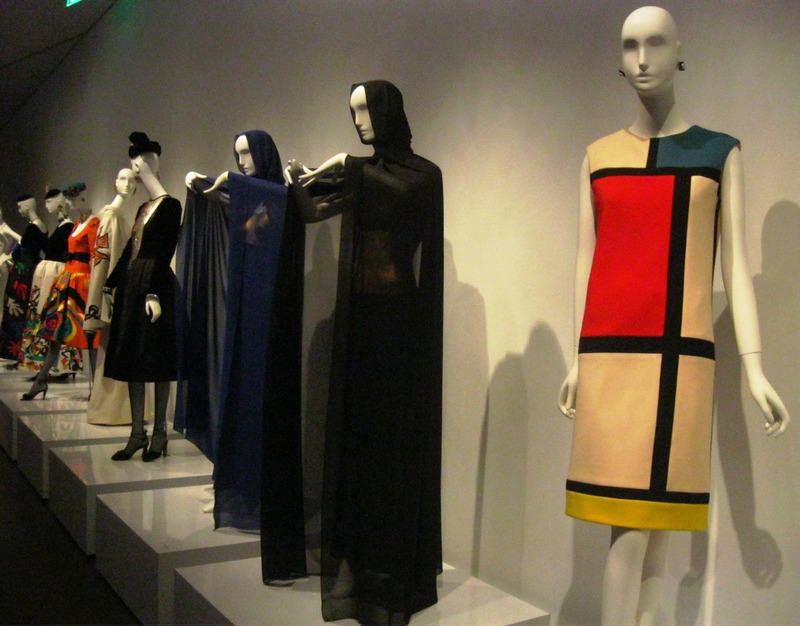 Likewise, his love of art reflected in his designs with dresses inspired by Mondrian and other artists. The most impressive display is the tuxedo room showcasing the multiple variations of one iconic design over several decades. 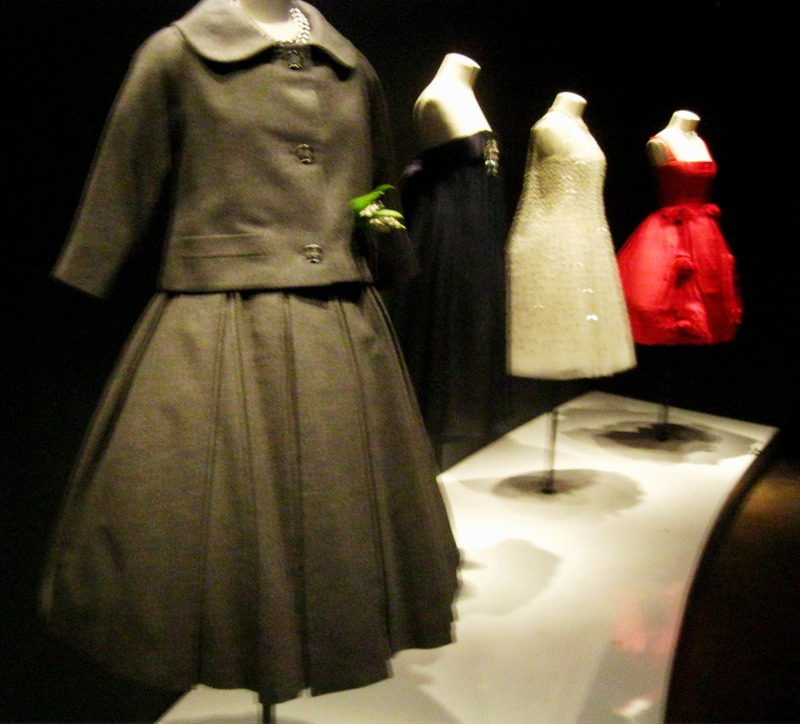 Yet the part of the exhibition that really took my breath away was the final one with the ball gowns. 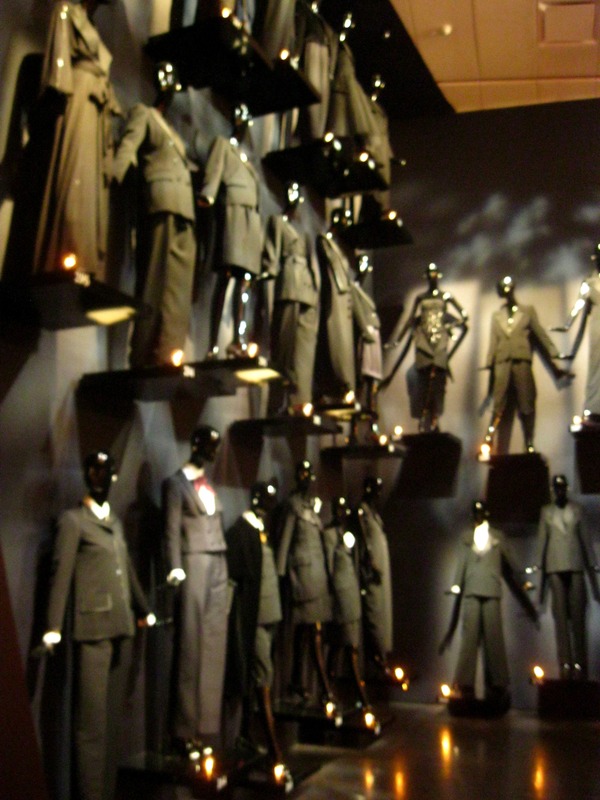 The picture below is only a small part of the display and not true to how elegant and beautiful it was. I wish I could have snapped away but – alas – a guard was glaring at me. 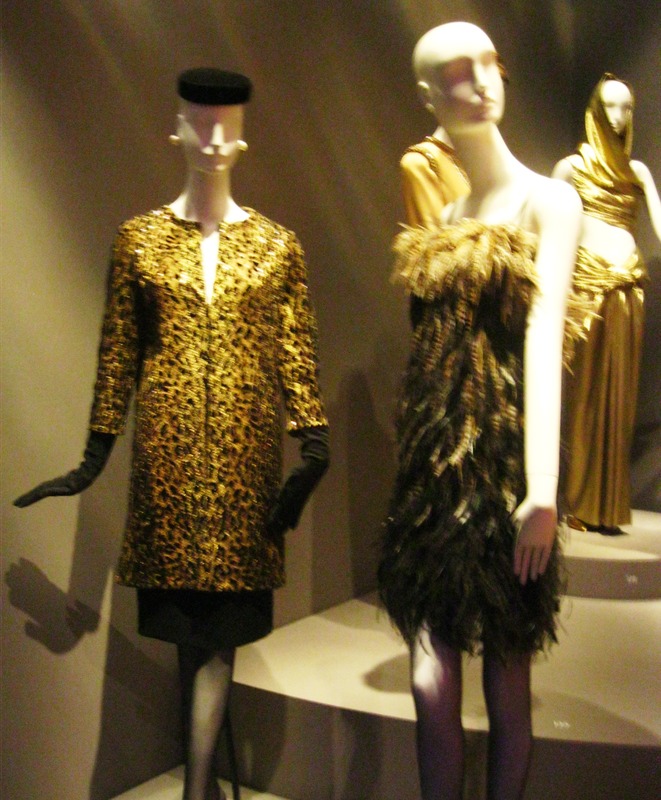 I truly believe Yves Saint Laurent will go down in history as the greatest designer of the 20th century. I wonder how Hedi Slimane, now head designer at Saint Laurent Paris, will use his heritage in his upcoming collections, if at all. I’m impressed with your knowledge of YSL. The only thing I associate the brand with is the Tuxedo blazer. I know little else. Thank you for sharing the information. So glad to see a new post from you. I saw the exhibit in Paris and I still think of it as the exhibition that I will hold all others to. The gentleman and I had the whole exhibit to ourselves and for a few hours we were lost. I agree with you the tuxedo room was out of this world. You are the Queen of covert photography Anne! I rarely visit fashion blogs any more but yours is different – full of knowledge and intellect. I like that. 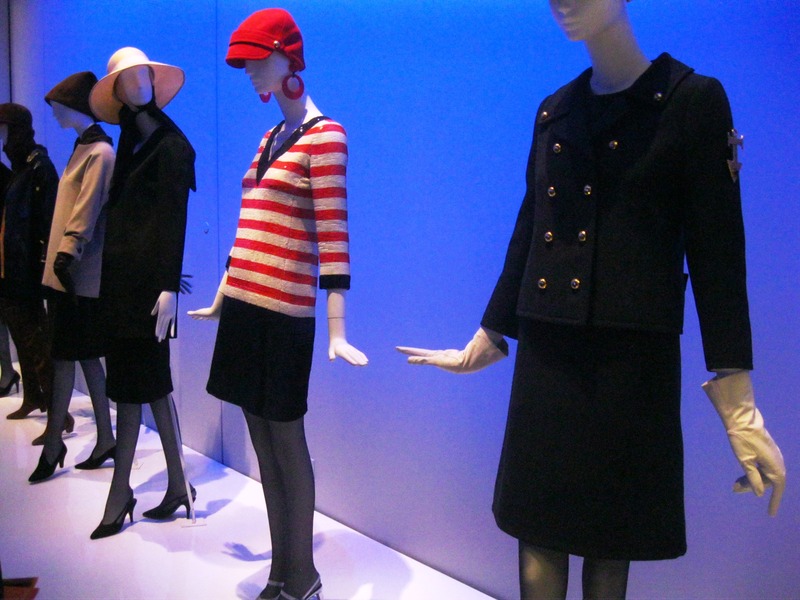 I love the way you write about the designer exhibitions, you take the time to really get to understand the thinking behind both the exhibition and the designer’s aims and objectives. Such a funny story about the muse who lost the trouser part of the suit to get into the NY restaurant. As for the 1971 collection, I recall McQueen’s collections were not all received well and are now high in very high esteem. Very interesting how thoughts and opinions can change over time. I was actually in Paris when this exhibit took place – but somehow must have been living under a rock, because I only found out about it on the afternoon of the very last day. In other words, I missed out… And I have been positively kicking myself for it ever since. 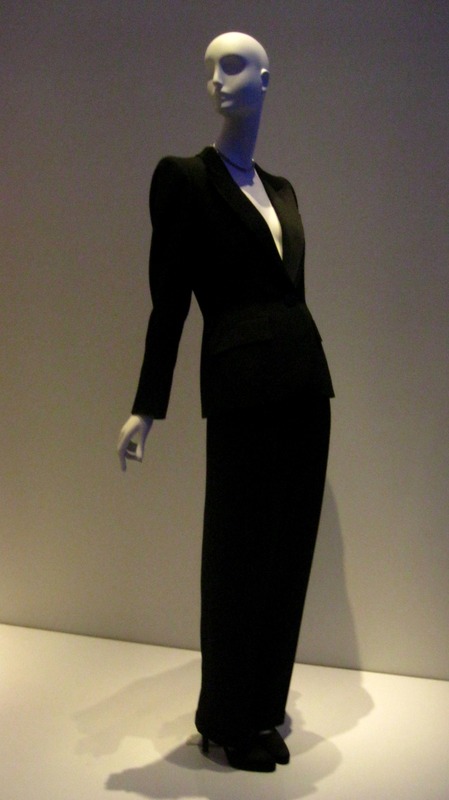 Yves Saint-Laurent is, without a doubt, one of my top three favourite designers, and to see so many of his pieces in one place would be a bit like my version of heaven. 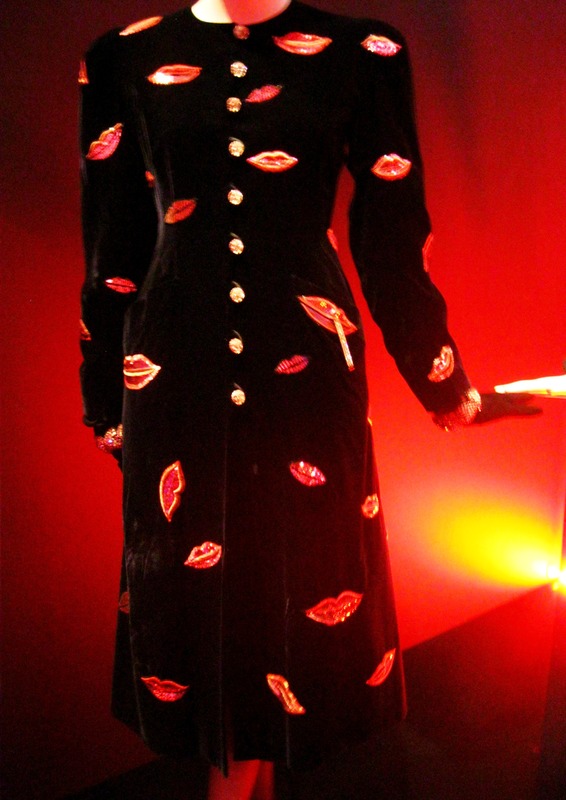 Especially that dress with the sequinned lips! I just love the detail of the one mouth holding a cigarette :) What a shame that a guard impeded you from taking as many photos as you would have liked, but you presented this just beautifully – I feel almost as though I really got to be there!